Giving an overview of anxiety-based disorders and the much needed strategies of treating them, Dr. Elliot Kaminetzky addressed students at The King’s College on Thursday., Feb. 8. Kaminetzky is a licensed clinical psychologist who specializes in Obsessive Compulsive Disorder (OCD), anxiety-based disorders and social phobia. Along with his personal practice, he works with college students as a clinical supervisor at Pace University, located in lower Manhattan. Kaminetzky suggests anxiety can be treated by using a holistic approach—re-routing maladaptive behavior and establishing new habits. “Some anxiety is part of the human experience,” said Kaminetzky to the modest audience of twelve. He went on to explain that in many cases anxiety can be harmful. As an expert on anxiety based disorders, Kaminetzky stresses many “faces” of anxiety can plague people. College students are particularly prone to the “face” of anxiety that is related to the high stress performance environment. Manifesting itself in diverse ways, there are many disorders that fall under the “umbrella of anxiety” such as OCD, panic disorders, phobias, or agoraphobias, and not to mention the very common disorder, social anxiety, among others. At the most basic level, anxiety is an emotion that all humans experience at some point in their lives — in varying degrees of intensity. Often, anxiety is not harmful. However, when a “fear” response is triggered (fight, flight or freeze), but no real threat is present, anxiety can become problematic. Generalized Anxiety Disorder, abbreviated as GAD, is defined as a future oriented mood or state associated with possible or upcoming events. In contrast, fear is an alarm response to present and immediate danger, both real or perceived, according to Kaminetzky in the lecture. Kaminetzky emphasizes two types of anxiety—“helpful” and “unhelpful.” Helpful anxiety is natural, and in many situations, good. For example, having anxiety when running from a bear protects you. However, “unhelpful” anxiety would be experiencing the same reaction — increased heart rate, rapid respirations and adrenaline pumping — at the sight of your own shadow, not a grizzly bear in pursuit. Unhelpful anxiety-related disorders can result in panic, fear, uneasiness, sleep problems, rapid respiration, heart palpitations, inability to function, nausea, dizziness, and other issues. Anxiety related disorders can be hard to identify and even harder to treat. Kaminetzky said this is because the way anxiety works is interwoven. After one’s sympathetic nervous system activates, there are three responses — physiological, cognitive and behavioral. In addition, the triggers for anxiety can be difficult to determine as people respond differently. As such, when someone’s anxiety surfaces, these interdependent factors can make it difficult to recognize, diagnose and treat. “Your fears tend to generalize and spread out due to association,” Kaminetzky said This is why anxiety often runs hand in hand with other mental disorders. Unfortunately, researchers don’t exactly know where anxiety disorders originated or what brings them on. Similar to other forms of mental illness, anxiety stems from a combination of many factors. These factors include changes in the brain, environmental stressors and genetics. “People often forget that depression and suicide is often linked to anxiety,” Kaminetzky said. According to the American College of Health Association, the suicide rate has tripled among young adults, ages 15-24 since the 1950s. Suicide is now the second most common cause of death among college students, according to the same research. is to start by changing maladaptive behavior. Maladaptive beliefs are false or irrationally supported ideas that cause triggers. 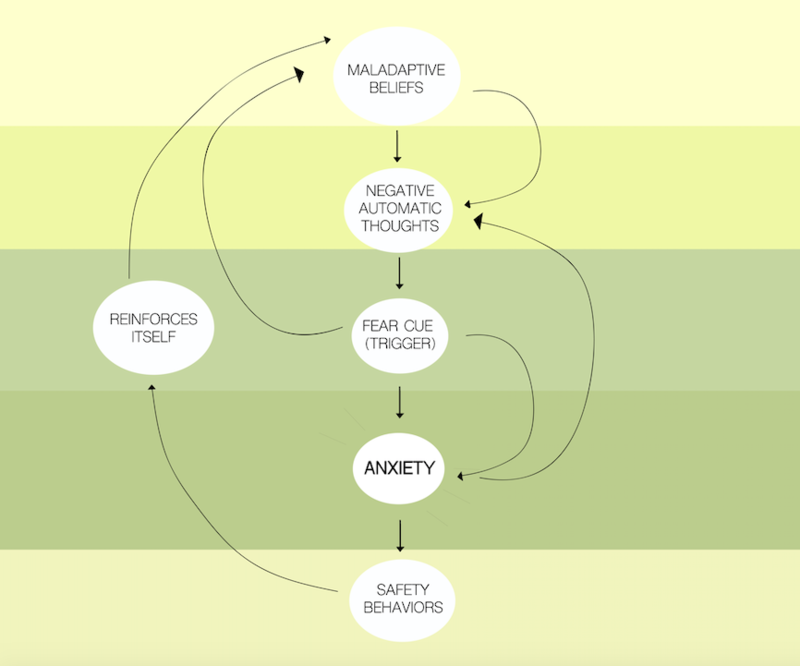 To break the cycle of anxiety, Kaminetzky says, exposure to triggers and preventing maladaptive coping can lead to adjustment of these maladaptive beliefs. If this process is repeated over a long period of time, new associations are made. However, Kaminetzky says that some may need medications first before starting this treatment process. “If we care about serving others on an intimate level and in delicate situations, then we need to learn more about how to care about what is going on psychologically, mentally and spiritually,” Murphy says. Kaminetzky says start by trying to exercise, eat healthy, implement good habits, get enough sleep, try meditating and be patient. It takes time to change comfortable ways of thinking and old habits die hard. However, if your anxiety begins to interfere with daily life, work or academics, if things aren’t changing or showing any improvement after time and effort, or if you are having suicidal thoughts, seek help immediately. Try for counseling: email counseling@tkc.edu to set up an appointment. Contact the TKC Emergency number: (646) 242-4411. Call 1888-NYC-WELL, for free mental health services.